Cargo Operations . :: Hellenic Imperial Airways Virtual ::. Imperial Cargo is a subsidiary company, and its purpose is making freight flights. The schedule includes destinations of the busiest airports in the world, reaching smaller and remote airports. Destinations demanding instrumental procedures will challenge the cargo pilot to his limits, as the pilot will need knowledge to make a safe trip. Sometimes the cargo pilot will have to make several strands to many destinations before returning to base, without the possibility of direct return. In this way the pilot is required to complete smaller or larger shipments. The schedule of Imperial Cargo flights includes small, medium and long term distance/time covering any requirement of the virtual pilot. The fleet of Imperial Cargo presents a wide variety of aircraft types, from a B1900C and turboprop C-130, the medium jet Boeing 732F, 734F, 737C, and the heavy Airbus 330F, MD-11ERF and Boeing 742F, 744ERF, 763F, 772F. Large airports known for their freight traffic such as Frankfurt, Cologne, Dubai, Chicago, Kuala Lumpur, Johannesburg, Melbourne and smaller airports, such as the Seychelles, Madagascar, the Canary Islands, Las Vegas, among the other to schedule the Imperial Cargo, either in direct flights from Athens or as parts of successive destinations. The Hubs where Imperial Cargo is stationed are Athens “ El. Venizelos” (LGAV), the Thessaloniki “Macedonia” (LGTS) and the Luxembourg (ELLX), and in the near future our goal is to add new hubs according to plan expansion the company. The Main Terminal Building handles the all intra-Schengen flights, as well as several non-Schengen flights. All check-in desks are located in the Main Terminal. It has three separate levels, one for arrivals, one for departures and a food court level complete with a view of the eastern runway. Satellite Terminal. The Satellite Terminal handles non-Schengen flights only. It is easily accessible through an underground link complete with moving walkways. In 2009, part of the Satellite Terminal was closed and a new above ground link to the midfield satellite terminal was completed by the end of 2010. The complex is now used as a Schengen facility. It has two levels, one for arrivals and the other for departures. 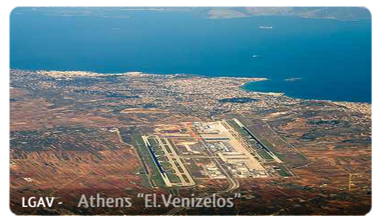 The airport was opened in March 2001 to replace the now-closed Athens (Ellinikon) International Airport. The first arrival was an Olympic Airways flight from Montreal and the second one was an Olympic Aviation flight from Kythira. The first departure was a KLM flight to Amsterdam. The airport is located between the towns of Markopoulo, Koropi, Spata and Loutsa, about 20 km (12 mi) to the east of central Athens (30 km (19 mi) by road, due to intervening hills). The airport is named after Elefthérios Venizélos, the prominent Cretan political figure and Prime Minister of Greece, who made an outstanding contribution to the development of Greek aviation and the Hellenic Air Force in the 1930s. The airport currently has two terminals: the Main Terminal, and the Satellite Terminal accessible by a foot-tunnel from the Main Terminal. As of 2009, a new above ground link to the midfield satellite terminal is under construction with a completion date by the end of 2010. Once completed, the complex will be used as a Schengen facility. It has two runways that are each approximately 4 km (2.5 mi) long. 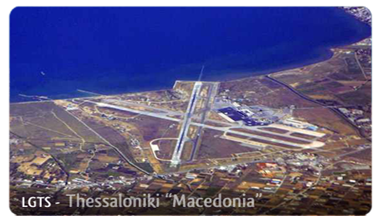 The airport was developed by public-private partnership with Greece holding 55% of the shares. The airport is designed to be upgraded over the ensuing years in order to accommodate the increase in air travel, and its upgrades are planned in a six-phase framework. The first (current) phase initially allowed the airport to accommodate 16 million passengers a year, but was upgraded to 21 million passengers a year with out progressing to the next phase thanks primarily to IT advances. The sixth phase will allow the airport to accommodate as many as 50 million passengers a year. The current runways are designed to accommodate 50 million passengers a year with the completion of the sixth phase. In 2010, the airport handled 15,411,952 passengers, 5% less than in 2009. Phase 2 of the masterplan has heralded the construction of a new larger terminal, together with a new apron for 36 aircraft, of which 14 will be stationed at contact place. The second phase of the masterplan will drasticly increase the status of the airport and eliminate existing passenger traffic problems, especially during the summer period. The new terminal will be able to accommodate 8 million passengers per year (in peak hours 2.800 passengers for departures or arrivals) while the terminal’s total area is expected that it will be 115.000m². In December 2010, the Greek government revealed that there are thoughts for the construction of the new terminal through private investing, the same way in which Athens International Airport was realised. Until now no further official announcement has been issued. During World War I the area that the airport currently occupies was used as an airfield and it continued operating as an airfield during World War II. At the time of the German occupation of Greece major projects took place, such as the creation of a 600m runway, while in 1948 the airport started operations as a civil airport for the first time. In 1950 the already existing (10/28) runway got paved with asphalt at a length of 1,800m and in 1952 it was extended to 2,000m. It was the same year that the first airport building was completed, with a control tower on the roof. One year later a new runway (16/34) was built. In 1958 the runway 10/28 got reconstructed and extended to a total length of 2,440m (current length), while runway 16/34 was extended to 2,400m, with its completion in 1972. In 2004 a new parallel taxiway of the 16/34, was opened for use. In September 1965 a new terminal building opened on a new location (current location). In the period between 1968 and 1973, the terminal was expanded, with the construction of a second floor and its first motorway junction. Due to the earthquake of 1978 in Thessaloniki, the control tower was destroyed, so a new one was constructed, independent of the main terminal building. The next expansion of the terminal took place in two stages, with the projects starting in 1991 and 1993 respectively. The municipality of Thessaloniki, as European Capital of Culture for 1997, took over a projects for the aesthetic intervention, renovation, modernisation and reorganisation of the spaces of the building. The terminal building took its current form, when an additional of 19,000m² were added to the western and eastern side of the terminal building, completed in November 2000 and June 2003 respectively. The western extension included the widening of the international departures area (new Extra-Schengen area ), including new administration offices, a new health station and the new station control of Olympic Airlines. The eastern expansion included a new check-in hall, new waiting halls and additional administrative offices for airlines. Today the terminal has a total floor area of 32,000m². Finally, during 2004-2006 the new motorway junction was completed on the level of the departures entrance of the Terminal and new parking spaces for cars, buses and taxis were created. 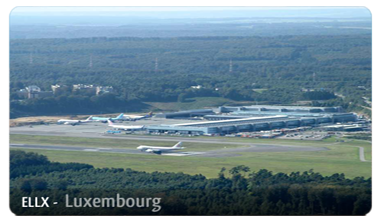 It is Luxembourg only international airport and is the only airport in the country with a paved runway. It is located 3.25 NM (6.02 km; 3.74 mi) away from Luxembourg City. The airport is completely international as there are no other commercial airports in the country. In 2010, it handled over 1.6 million passengers, an increase of 5.1% over the previous year. Luxair, Luxembourg international airline and Cargolux, a cargo-only airline, have their head offices on the airport property. By cargo tonnage, Findel ranked as Europe’s 5th and the world’s 28th busiest in 2010. The airport was originally known as "Sandweiler Airport", and was opened in the 1930s as a small grass airfield with a relatively short, 3400 (1000m) runway. Neutral Luxembourg was invaded by Germany on 10 May 1940, and on 21 May, the Luftwaffe assigned Jagdgeschwader 53 (JG 53), a Messerschmitt Bf 109 fighter unit to the airport. JG 53 was engaged in combat against the French and British Expeditionary Force in France during the Battle of France in May and June. In additive, Jagdgeschwader 52 (JG 52) also operated Bf 109s from Sandweiler during the Blitzkrieg. JG 52 moved into France on 29 May, however JG 53 remained in Luxembourg until 18 August until moving closer to the English Channel to take part in the Battle of Britain. Sandweiler Airport remained unused by the Luftwaffe until September 1944, when a reconnaissance unit, Aufklärungsgruppe 123 (AKG 123) was assigned to the airport which flew the Henschel Hs 126, a two-seat reconnaissance and observation aircraft. AKG 123 moved east into Germany after only a few days when the United States Army moved through Luxembourg and cleared the country of the occupying German forces.